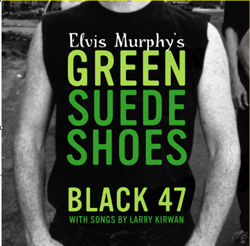 "Elvis Murphy's Green Suede Shoes"
Gadfly Records is proud to announce the release of Elvis Murphy's Green Suede Shoes from seminal Irish rockers Black 47. It is a unique new album that is a rich biography of a group that has been established for 15 years as "New York's house band." It is the companion to a book memoir ("Green Suede Shoes") by group leader Larry Kirwan being released simultaneously by Avalon Publishing. Elvis Murphy's Green Suede Shoes is a unique project that combines six all-new songs with four tracks from Kirwan side projects, and two tracks re-recorded from previously deleted albums. It is a combination of story-songs that tells a story -- of an Irish immigrant's hopes and dreams upon arriving in America, and all the highs and lows that accompanied his integration into the big bold worlds of both the United States and Rock and Roll. Taking their name from the blackest year of the Irish Potato Famine, Black 47 burst out of the Irish pub scene on the success of 1992’s Fire of Freedom (EMI). With their signature eclectic sound, socio-political lyrics and off-the-wall live shows, they paved the way for other Irish influenced bands such as The Dropkick Murphys and Flogging Molly. Black 47’s songs articulated the hopes and fears of working people, and they became the musical voice for young, politically aware, Irish Americans. Their cutting-edge lyrics are now used in political science/history courses in hundreds of high schools and colleges.